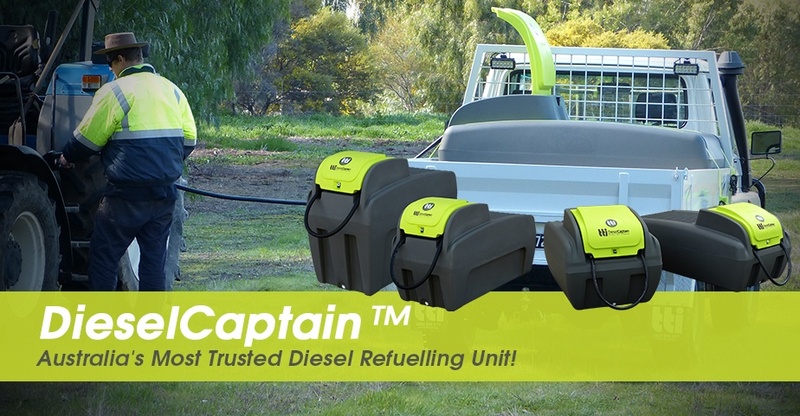 TTi DieselCaptain- Australia’s Most Trusted Diesel Refuelling Unit! TTi’s DieselCaptain Units make transporting diesel easy. The TTi DieselCaptain, complete with 15 year tank warranty, is specifically designed to withstand the toughest conditions. Weigh much less than fiberglass and steel, increasing your payload. Large lid opening for ease of cleaning and inspection with gasket seal to secure diesel from leaking. Ergonomic lifting handles for ease of transport. All TransDiesel tanks comply with AS1940-2004 and AS2809.2-2008. Moulded with our unique aluminium ring for incredible strength; this multi seal system keeps the rain out, and your diesel in. Strong poly lid to protect pump compartment. Locking latch for lid, to protect your investment. TTi has been manufacturing Diesel Tanks for nearly 20 years, which is why we are confident in offering a 15 Year Warranty on all our Diesel Tanks!